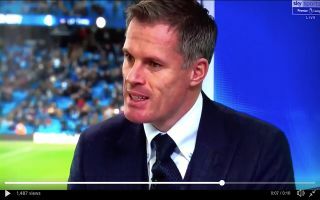 Sky Sports pundit and Liverpool legend Jamie Carragher didn’t hold back with his assessment of Chelsea’s first half performance against Manchester City. Chelsea found themselves 4-0 down against the defending champions, inside just 25 minutes. The Blues have failed miserably in their efforts to cope with City’s deadly attacking threat and Pep Guardiola’s side have embarrassed them this afternoon. Chelsea have always held their own against the teams in the top six, they don’t have the best top six record but they usually show much more fight than they have today. Arsenal’s struggles against the teams in the top six are well-documented, the fact that Chelsea have been compared to the Gunners after their woes today shows that their season is spiralling out of control. From looking like title challengers at the start of the season, the Blues now look as though they’ll struggle to even finish in the top four – this means that the West London club will be without Champions League football for the second season in a row. Chelsea either need to get their act together in the league very quickly or they’ll need to put all their eggs in one basket and hope to win the Europa League – this is no easy task given that the pool of teams include; Inter Milan, Arsenal and Europa League specialists Sevilla.